Indypendent readers most likely know Honduras as the site of a right-wing coup in 2009 and as one of the main sources of Central American migrants to the United States. Dana Frank’s The Long Honduran Night provides a third reason to pay attention: Since 2009, Honduras has been the site of many inspiring resistance movements that may have relevant lessons and parallels in the United States. Frank, a retired history professor who has long been committed to solidarity work with Hondurans, proves to be a capable guide to this terrain and has written a book that deserves more attention. There are some surprising parallels between this poor Central American country and the imperial giant to the north. Frank begins her account with the 2009 coup that ousted President Manuel Zelaya. Zelaya was a member of the Honduran elite but had made some reforms and, in the context of mounting resistance from the right, initiated a referendum on a constitutional convention. Resistance after the coup blossomed in the form of the National Front of Popular Resistance (FNRP, its Spanish acronym), an alliance of social movements that built on earlier coalitions. The Organization of American States (OAS) was sympathetic to Zelaya and a restoration of democracy but the Obama administration undermined that in favor of negotiations held on U.S. terms. But when Frank returned to Honduras shortly after the inauguration of President Porfirio “Pepe” Lobo, elected in the shadiest of conditions after the coup, she was surprised to find an “exhilarating” mood in which “everyone I knew was full of excited energy, and a new culture of resistance was bursting out all over.” Nevertheless, this resistance was not able to halt repression and the passage of terrible laws relating to labor and mining. Few in the American media bothered to investigate. Soon political dilemmas began to overtake the resistance. While the FNRP unified social movements with politicians and activists from Zelaya’s Liberal Party, Zelaya’s installation as its leader in 2010 cemented him as the cult figure at the center of the resistance. But when his return to Honduras was engineered, with the assistance of the presidents of Colombia and Venezuela, that legitimized the Lobo regime for the OAS, and Obama and the U.S. media warmly embraced it. The massive crowd that greeted Zelaya — perhaps one out of every eight Hondurans — indicated the struggle was far from over. Frank highlights many disturbing episodes of the repression that continued, including militarized actions against peasants and a prison fire that killed 350 inmates. Frank had some success advocating that the U.S. Congress and the media take a more skeptical attitude toward U.S. policy in Honduras. Her account of this is well worth reading. In 2012, the FNRP split. Zelaya formed a new political party, LIBRE, and the social movements were now outsiders that had some connections to the new party. But Juan Orlando Hernández, a Machiavellian right-wing figure, centralized power in his hands as president of congress through a “technical coup.” The U.S. government embraced him, supplying his regime with money for the war on drugs. In the election of November 2013, Hernández was challenged by LIBRE’s Xiomara Castro and Salvador Nasralla, the candidate of middle-class people fed up with corruption. Amidst repression, fraud, and claims that LIBRE might violently rebel, Hernández was declared the winner. But LIBRE won a considerable presence in the incoming congress. Before it was seated, Hernández engineered the rapid-fire passage of 120 laws and 80 executive orders, imposing privatization and walling off the government from transparency. He denounced LIBRE as the enemy within. The whole conversation about Honduras shifted, Frank writes, “precisely as congressional criticism of U.S. support for the Honduran regime achieved its potential tipping point,” in 2014 when the news broke that more than 57,000 undocumented, unaccompanied minors from Central America were heading to the United States. The “threat” of the children was seen as emanating from the “Northern Triangle” of Central America. Drugs and gang violence were given as the reasons for the migration, with no insights into how the destructive governance of the previous five years might be driving those developments. This focus affirmed Hernández’s government as the fighter against such violence. In 2015, a new form of protest broke out, in response to a scandal involving the theft of $90 million from the Honduran National Health Service. Tens of thousands marched with torches, branding themselves “indignados.” As often seems the case with anti-corruption demonstrations, the tone was set by large middle-class participation. Some protesters were clearly hostile to LIBRE, although their central demand was for Hernández to resign. In 2016, environmental leader and feminist Berta Caceres was assassinated. “Now everyone in Honduras knew they would really kill anyone, no matter how famous,” Frank writes. Her murder renewed pressure from longtime critics of U.S. policy such as Senator Patrick Leahy (D-Vt.). But Rep. Norma Torres, a Guatemala-born House member from Los Angeles’ eastern suburbs, drew on her identity to legitimize a more conservative approach. In November 2017, after a dubious process by which Hernández was allowed to run for a second term (against the constitution of Honduras, and precisely the pretext for the coup in 2009), the ruling party outright stole the election. This vote had considerably less legitimacy in the eyes of U.S. media, and it produced enormous, violently repressed demonstrations in Honduras. But the Trump administration continued aid to the repressive apparatus. The Long Honduran Night is a great book, both engaging and politically significant. There are some surprising parallels between this poor Central American country and the imperial giant to the north, although, as if in a funhouse mirror, the social movements in Honduras are more radical, the privatization schemes more relentless and craven, and the repression unleashed on resistance far deadlier. The broad left in the United States has generally paid little attention to Honduras. It should recognize the potential unity throughout North America of the many social actors trying to fight back against governments that serve only the 1 percent. 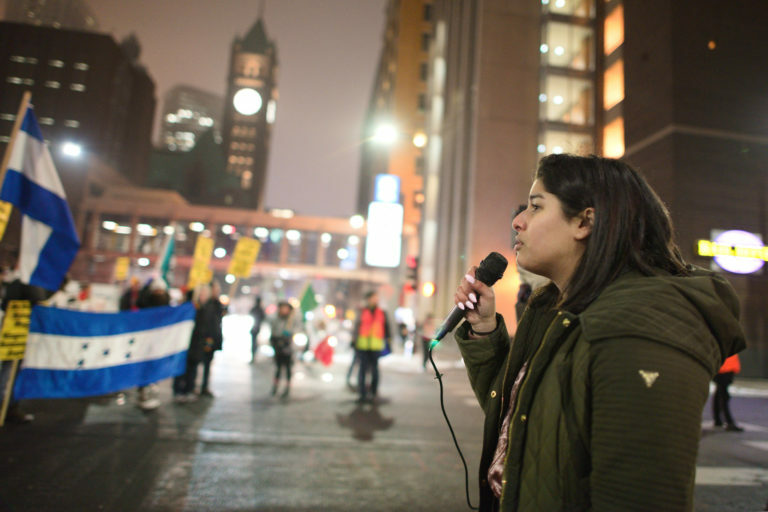 Photo: Demonstrators in Minnesota rally in support of Honduran refugees. Credit: Fibonacci Blue.